The Government must “honour its pledge to increase fuel duty in line with inflation” to help cut emissions and drive use of public transport. That’s the message from a new report on ‘The Unintended Consequences of Freezing Fuel Duty’ by former government transport advisor David Begg which also finds the freeze on fuel duty since 2011 has caused an extra 4.5m tonnes of carbon dioxide (CO2) emissions, 12,000 tonnes of NOx emissions and 816 tonnes of PM10 particles. 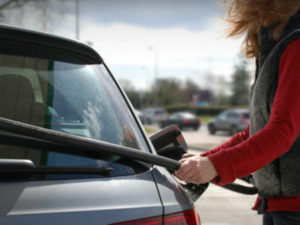 According to the report – carried out for the Greener Journeys campaign to drive public transport usage, led a coalition of UK public transport organisations – the freeze in fuel duty, which means that pump prices are 13% lower than they would otherwise have been, has also led to 4% more journeys by car. If drivers had used public transport instead for these journeys, this would have amounted to 60 million more train journeys and 200 million more bus journeys. Professor Begg also warned that unless a new way to pay for road use is introduced, traffic on our roads will increase by an additional 30% by 2035. This is on top of the 40% growth in traffic already predicted by the Department for Transport, leading to an overall increase in traffic of 70%. He added that electric vehicles – which qualify for lower or zero rates of VED and reduced company car taxation – will impact on Government finances and also provide a further argument for finding a new way to pay for road use – while also pointing out that the move to autonomous vehicles presents a window of opportunity to move to a new model. Professor Begg, who is the chief executive of the Transport Times title and former chairman of the Government’s Commission for Integrated Transport, said: “Whilst the freeze in fuel duty has been welcomed by many road users there have been unintended consequences in terms of increased pollution and congestion and a shift from public transport to car use, which policy makers should be aware of if they continue with this policy. However, the RAC dismissed some of the main conclusions of the report. RAC roads policy spokesman Nicholas Lyes said: “Millions of motorists and businesses are going to baulk at the idea of fuel duty rising in the autumn. Petrol and diesel prices are currently at a three-and-a-half year high, and there is the prospect of them reaching record levels if the oil price continues to climb. In this scenario, we should be talking about the Government acting to help bring prices back into check by lowering fuel duty to protect the economy – not putting up tax on fuel. And Paul Holland, chief operating officer at Fleetcor – parent firm of Allstar, said the Government must consider other factors. Holland explained: “The infrastructure to support alternative fuels, including hydrogen and electricity, is not yet widely available, making it very difficult for businesses to consider using them. Additionally, vehicle ranges, whole life costs and other operational affecting factors are still developing, further complicating companies’ decision making.